During a recent engine change over, the I had the problem of fixing the clutch pedal in place and getting rid of any free play. I am also using terminology from the Austin 7 Spares list 1029A, 1933, pages 33 – 34. A copy can be viewed on the A7CA's web site. What exactly are we trying to do? Photo. 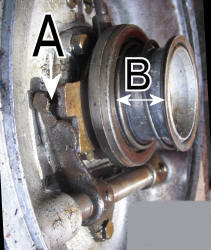 left - Play shows the two spindle mounted Clutch Fingers in free space between the back of the housing and the Clutch Withdrawal Collar at (‘A’), we want to eliminate that – stop any rattling - we are also attempting to compress the Clutch Thrust Bearing Spring and bring the Clutch Thrust Bearing (‘B’) closer to the Clutch (Withdrawal Plate) Levers, without actually touching them. Austin’s put a slot in the end of the spindle (Photo right) to enable a very short, but broad bladed screwdriver or similar to go in there to help twist the Spindle whilst tightening up the clutch pedal clamp bolt from under the car. I wonder who's bright idea that was, it certainly did not work for me, there was no room, let alone seeing what I was doing under there (plus bifocal’s focusing in the wrong place). I looked in Doug Woodrow’s Manual and other booklets etc., to find a method, zilch! There are hint’s in the 750MC’s ‘Companion’ of magazine extracts, one of which dates from 1959, but there’s nothing explicit, nothing to help Joe Bloggs. During a chat with fellow member Andrew Jarmin, this topic came up and Andrew very kindly sent me a drawing of 'The Tool' he has created to make clutch pedal adjustment etc., simple. I bought some steel, 14 x 3 mm bar, chamfered one end to something like a chisel point and on a spare gearbox I tried to work out how Andrew's item would work. At this point I ignored all the good advice and went off at a tangent creating a major surgery method, rather than Andrew’s ‘Keyhole’ process – I should have read the instructions! I did put a piece of yellow tape at the point the lever has gone down the right distance into the Clutch area – and it’s gentle on the gearbox’s metal edge, this is approx. 4.5 inches (115mm) from the chisel point to the centre of the yellow tape. The tool is not white, this is for photo legibility. So, nip up the Pinch Bolt on the Clutch Pedal Lever Arm (from under the car) so that it just grips the Clutch Lever Spindle. 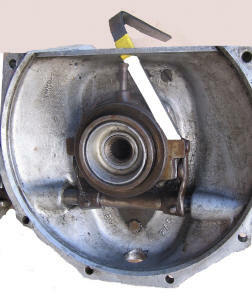 Then inside the car, lightly push the Clutch Pedal down so that the Thrust Bearing Oiler has moved towards the engine, clearing the Oiler Hole and the Thrust bearing itself contacts the Clutch Levers as shown in the last photo but without ‘The Tool’, yet. 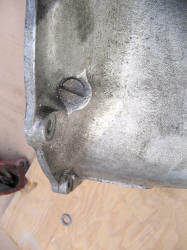 Insert ‘The Tool’ into the Clutch Oiling Hole in the top of the gear box moulding at about 60 degrees as shown in photo left, fiddle with the end of the lever until it is trapped behind the Operating Arms on the clutch shaft - the Clutch Pedal will not then be able to move back freely, and then push until you feel the Clutch Thrust Bearing is onto the clutch levers, it’s then a lot firmer to push, let the Clutch pedal come back a shade. 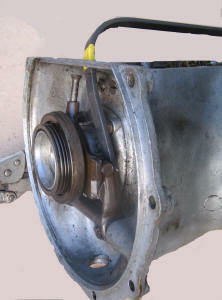 Under the car, and release the Pinch Bolt on the Clutch Spindle Shaft and push the Clutch Pedal Lever Arm back to where you want it to be (normally as far away from the engine as possible so there's no slack), tighten the Pinch Bolt up on the Clutch Pedal Lever Arm as very tight as possible. Job done, and I’ve ditched my major surgery idea. That’s my trouble, the ‘Black Hand Gang’ know what they are doing, unfortunately I joined the ‘Cack Handed Gang’. NB: The 'Black Hand Gang' are our group of experts who always seem to have oil on their hands. This article, written by Sandy Croall, originally appeared in CA7C Seven Focus, May 2012 pp24-26.